The crew and I wake up to the sound of truck engines at the Flying J “Travel Center” in Gillette, Wyoming. The task for today is to find a replacement battery for my Verizon air card. I call up Verizon and I’m told the battery cannot be obtained in Gillette. The Verizon rep refers me to one of their “indirect” stores in Buffalo, Wyoming, about 70 miles to the west. At least that’s in the direction of Yellowstone. After buying propane at the Flying J, the crew and I motor westward on Interstate 90. The mountains at Buffalo are a welcome sight. I try to call the store on the way, but their automated phone message says their store hours are 10 to 5 on Sundays. By the time I take the Buffalo exit, it’s 10 o’clock. I call the store and get the same automated message. It includes a prompt to leave my name and number and “we’ll call you right back.” I do that and wait . . . and wait . . . and call again. Same automated message. It’s getting hot in the PTV and the crew is restless. I drive around until I find someone who can give me directions to the store. The traffic is heavy in this part of Buffalo. Finally I find the store and manage to park the PTV and BLT in its tiny parking lot. I go to the door of the store and notice a paper taped to it. I am absolutely livid. I can barely breathe I am so angry. I call the automated phone message and let Verizon know that since they are a PHONE COMPANY they ought to know how to change their phone’s recording to reflect their new summer hours. I also let them know I drove 70 miles to read their #%*@& “closed” sign. I drive seven miles north of Buffalo on Interstate 25 so we can camp at Lake De Smet. Lake De Smet Campground is a loosely run affair. A guy at the gate is more concerned with making sure the boats coming in don’t bring in bacteria or snails or something. I ask him where the campground is and he says to pick a spot anywhere along the water. It’s $10 a night. The place is crowded all along the accessible water. There isn’t any shade. It’s hot. I’m still irritated. The last thing I need is to camp next to people having fun. I’m outta here. I drive about 35 more miles to Sheridan, Wyoming, because there’s no place to boondock in desolate, exposed prairie. Sheridan is not a tiny place. Surely it will have a battery for an air card. I call Verizon. The Verizon lady calls four Verizon outlets. One doesn’t stock that battery, two don’t have it in stock but they can order it and it’ll be here IN A WEEK, and the fourth store isn’t open. I’m in a strange city on a hot afternoon. It’s Sunday. I don’t know where any public land is located, and I don’t have internet to find any. I can’t go wandering up these huge mountains. It’s too hot to leave the crew in the PTV while I use the library’s internet. Judging from the touristy billboards, any RV park around here charges top dollar. What am I going to do? I drive around until I find a county park. It’s comprised of a ball field, a skateboard rink, a playground, some grass, a few trees, and a parking lot. I park the BLT in the lot in the shade of a tree. I walk around with Bridget and Spike, trying to stay cool. Later I go to bed hoping the police don’t come by and kick us out. This has been one heckuva, unproductive day! Good night! Well, the cops didn’t come for me in the night. So far, so good. The crew and I go through our usual morning routine: toileting walk, breakfast, coffee, regular morning walk, bath, etc. During crew naptime I call the one store in Sheridan that might possibly have a battery for my air card. I call. They don’t have it. I call the main Verizon office again. Of course every time I phone Verizon I go through several automated steps. One wrong move and I have to start over. Every time I get a different person so I have to retell my story each time, beginning to end. To make a long story not quite as long . . . I end up driving from Sheridan, back to Buffalo, and from Buffalo to Casper, Wyoming. This adds another 148 miles to my battery quest. I find the Verizon store in a mall in the busy city of Casper. I take Bridget and Spike into the store with me because it’s awfully hot outside. At this point I dare anyone to object. I tell my story to the manager. He tries to make good as much as his corporate-controlled computer software will allow. I walk out with a new air card that normally retails for $269.99. I pay $99.99. I also pay a $30 upgrade fee. I don’t have to pay the $95 contract cancellation charge. The total cost is $136.49 which includes $6.50 tax. Instead of 3 gigabytes a month, my new 2-year contract is for 6 gigabytes a month. Instead of $35 a month, now I pay $60 a month (My old deal is no longer offered.). Bridget and Spike have been angels all day. I’m amazed at their good behavior. Not a sound out of them on the road. When we stopped at a rest area, they did their business and hopped back in the PTV. In the Verizon store in the mall, they sat quietly at my feet. In fact, they were better behaved than the middle schoolers fooling around with the iPad display. Even the store manager was impressed. I drive over to Wal-Mart and buy a rotisserie chicken. Bridget and Spike get hefty portions as their reward for being such good travellers. At long last I have internet again. Tonight we sleep in the mall parking lot! Not all fulltiming is pristine lakes and scenic wonders . . . This entry was posted in Simple living and tagged air card, Buffalo, Casper, Gillette, Lake De Smet, RVing, Sheridan, Verizon, Wyoming. Bookmark the permalink. WOW! Tomorrow will be a better day. Hi Brian … Yeah… I’m glad I’m online again! Remarkably well controlled Sue………….I would have killed someone for sure for such a run around !!!! Service these days leaves a lot to be desired sometimes whether it be in the US or in OZ. AND your darling dogs………..how perfect and patient are they! Glad to see you back on line!! Hi, Glenda . .. My crew is the best! I remember this time last year, when I drove to Florida from Athens, GA, taking Bridget on her first road trip, she cried all the way to Jacksonville! I certainly fear that kind of day…… The good news is they happen even when you have a stick or stone home. Have a blessed evening with lots of rest. Yellowstone ahead!!! I reminded myself that this is part of modern life, rather than blame it on fulltiming. There’s no guarantee of a problem-free life. . . look at all the people without power during the recent heat wave! Glad you are online again!! I have heard other horror stories about Verizon. Too bad. So sorry you have been given a “run for your money”!! Seems to me that the Verizon company OWES you more yet…do consider writing a letter to headquarters…and let them know that you have readers and you told your story…heh, maybe they would like some better press and thus will give you ALL that money back!! There was a time I would have pursued a complaint. At this point in my life, I’d rather put it behind me and move on. I wasted enough time, energy, and gas on it! Well, you handled the day and frustrations better than I would have. Verizon would have lost a valuable customer. Now maybe you can get back to the business of having fun. Well, Rick, if there had been a competitor’s store around I probably would’ve switched! Now that I’m not angry any more, I’m okay with the deal I have. Oh NO. But I guess you should expect an occasional “gottcha”. What a bummer that you have an increased monthly fee on top of the new aircard. Hopefully it will provide better service. But if you were posting pictures and writing the blog just fine on the original 3 gb without going over, sounds like 6gb is overkill. Oh well. Sometimes you just can’t win. You have our sympathy. Not all surprises are good ones. “Not all fulltiming is pristine lakes and scenic wonders . . .” but the PTV and the BLT look pristine. You’re taking good care of them. Tomorrow will be better and the scenery prettier. I don’t need 6 gb. I would have gone with 4 gb, but it was only $10 more for 6 gb. I have gone over the 3 gb limit some months, which cost me another $10 for an additional gb. Verizon doesn’t offer a 3 gb plan any more. We were rained on at Bear Butte and again today on the way to Casper, so the PTV and BLT are cleaner. Having lived in Idaho, a lower population state (like Wyoming), you will notice that some companies do not bother much with having things stocked…which is not the fault of the local people, but the fault of headquarters in some other state, like maybe California which would have the lion’s share of business. I’m learning to expect things to be out of stock. I guess people out in these rural places get used to waiting a week or more for things to be shipped in. Oh, Sue, I feel your pain! Verizon will get us one way or another. And if it’s not Verizon it will be another carrier. I love the West but sometimes the isolation is downright inconvenient! I feel sorry for people who live in these rural areas with vast, empty spaces between cities and towns. I’m spoiled by convenience. LOL I want both, convenience AND vast open spaces! The one advantage perhaps of a sticks and brick location, is being able to order things over the internet to be brought to the door. Back before the internet, I ordered as much as I could from catalogs…it sure beat going out to get them for a great many reasons at that point in my life!! It won’t work for everything one needs, but today, once you know what product you want, you can usually save so much time and torment going via UPS, or USPS. That is one reason if we go the RV life, we might try to stay a month or 2 at a time in a region…thanks for sharing all you do…it gives us a lot to consider and ponder!! What a really crappy mess dealing with Verizon. Glad to hear the manager was able to help you a little. Hope all these electronic things start turning around for you. The camera, laptop and wireless card! Gremlins go away!! Wishing you and the crew a better week. Technology troubles come in threes… camera, laptop, air card. Everything should work well for a while . . . Thanks for your sweet wish. Might not help you much, Sue, but I went through something very similar with Verizon in New Mexico. Oh, I’m sorry you share my pain! a very warm Chuck n Geri n Hound Herd. Sleep tight…….you and the crew….for today is over and tomorrow is a new day of adventure. Occasional hassles are part of modern life. You can’t get away from that. Sue, all I can say is…..I FEEL YOUR PAIN. In addition to many other factors, Rhonda and I are very much looking forward to the big exit for this very reason, the world has come undone and no one you try to give your money to cares. As you have pointed out here, we can’t totally excape it, but with planning we may be able to avoid a lot of it. It is really a shame that the phone companies do not insist on a higher standard, but it is all the same, no big co gives a S&$!. BTW, i have a Droid, and use FOXFI, to avoid the monthly charge. This gives me the WIFI internet connection using my smart phone for no more cost than the phone. I’m not familiar with FOXFI. I’ll have to look that up. Thanks for feeling my pain and for writing . . . . I would like to hear more feedback from folks using FoxFi if it’s ok with you Sue! Pros? Cons? I’d like to hear about FOXFI, too! Aww shucks… Hang in there, Sue! Maybe you’ll find some feature on your new phone that is totally awesome. Have you tried the Google Navigator app? I just found it and like its features better than our Garmin. And it’s free! I didn’t get a new phone. Verizon tried to bundle my air card internet with a phone. My response? ” No thank you. I have a cheap WalMart phone with Straight Talk. If the phone ever needs a battery, I can walk into any WalMart and get one.” That ended that sales pitch. Sounds like a plan! Looking back on the past year, I’ve had more than my share of good days. Sue, I am so sorry that things are not going well. There are days like that. As I read that you were driving toward Buffalo, WY I hoped the story would improve. Last fall we visited Yellowstone and spent one night on the way in Buffalo visiting a former college roommate of mine. I hadn’t seen her in more than 40 years. She had hardly changed and was married to a much nicer husband than the one she had at first. We stayed in a Comfort Inn they owned and had a lovely room. She gave us the Grand Tour and we enjoyed what we saw. The hotel in town is quaint and I got some great pictures. The Red Hat ladies were there. There were pictures in the hallway of many of the famous people who had stayed there. There were no elevators, so as charming as it was, it would not have suited us. But I loved seeing it. Then we went to her home and had a terrific dinner on their deck. We saw deer in the backyard. We ate lots of Nancy’s home-grown vegetables. The tomatoes were the best I’d had all summer. The next day we drove on our way, but we’d had a wonderful visit. Small towns are not for everyone. I personally prefer larger communities, but I could see that it was a good place for my friend. What a wonderful visit you had in Buffalo! The place was bustling while I was there. It looked like a fun place. After reading that sign on the door, all I wanted to do was get out of there! “I feel sorry for people who live in these rural areas with vast, empty spaces between cities and towns. 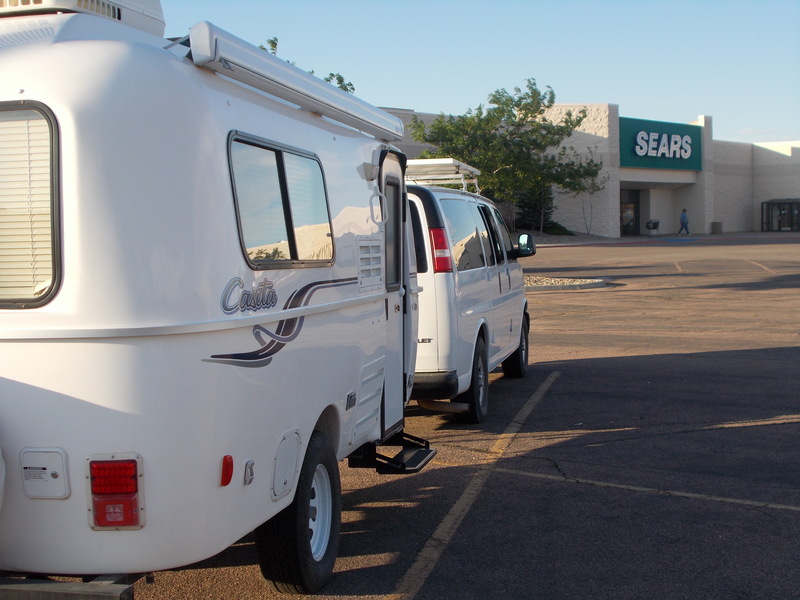 I’m spoiled by convenience.” Very astounding comment from an rv boondocker. Well I for one fully understand the frustration and EXPECT to have the convenience, after all I am PAYING out the A$$ for it. The only thing I think that could be questioned here is that it (the total lack of concern for the Customer ((YOU AND I)) is NOT by any means limited to the rural areas of this country. I live in a city with over 1.5 mm people and totally relate to the run around Sue had trying to get that battery. Ha! Yes it is OFM. I feel sorry for them because they can’t move their homes whenever they want to. I feel sorry for them because many of them are in the time of their lives when they are dealing with the complex task of raising a family and making a living. Inconveniences are annoying to an rv boondocker. They must be a lot worse for the people rooted to one spot. Wow that was frustrating. Sounds like Spike and Bridget are totally in tune with your moods and act accordingly. I didn’t read all the replys so this may have been suggested. Next time you are in need of free wifi/internet try Starbucks or Wendy’s. Often you can sit in the parking-lot and use it. At least here in CA that and Panera bred is where I get wifi away from home. I’ve used libraries and McDonald’s parking lot for WiFi. My concern was to get my own MiFi up and running as soon as possible. No way I was going to sit in a parking lot with my crew on a hot, hot day! It does take some planning when living in very rural areas, and patience. I would have reacted badly to the Verizon people, and have. I too will use the free FOXFI tethered from my Droid when not on the North Rim, where I have NO signal and have to pay for a land line and DSL. These companies have us by the virtual balls. I so rarely see good service at any service business and get easily frustrated by inefficiency. I often wonder if anybody cares that they get paid to help others, or just get paid. Think I’ll continue to live in the woods. And pray my technology does crap out. I know what you mean, Gaelyn. I expected a royal hassle going in, once I had to call Verizon’s main office. I think some of the reason for poor service at the lower levels is the fact that people are poorly paid and they were under the impression that they’d have the “good life” once they got a job. It doesn’t work that way. I’ve been following and enjoying your blog for many months. In spite of the “run-around” you’ve recently had in Wyo., I hope you enjoy your brief stay in my home town of Casper (I’m less than 5 minutes from the mall). Summers here are spectacular and the evenings usually cool down nicely. Yep, it’s about 2 hrs. to get anywhere from here. I hope to take my 16′ Scamp for an extended journey some day and have learned alot reading about your experiences. Thank-you. I came down to Casper from Yellowstone/Teton. I came over a road with a pass where they had started paving and stopped so went slipping’ and sliding’ in loose dirt–crossing my fingers that it didn’t rain. Do you know what route you are taking to the parks? Let me know and I’ll look in my Mountain West Directory so you know what’s ahead of you. I didn’t stay long in Casper. I like the town, seems like a parade and rodeo were planned for that day. I’m glad you are enjoying my blog. I hope you get to take that “extended journey” and have a wonderful time! I don’t want anybody to be happy around me when I’m not happy, too! And thank you, WJ, for writing such a nice comment to me and the crew! You’re right, Kittie! The plan I had was a bargain by today’s rates so that’s why the battery is unavailable. Oh, I don’t mind parking lots. They feed my miserly nature. Sorry to read about your frustrations with Verizon. You are right, whether you are full timing it or at home, there are going to be frustrations. I was without internet for 2 days. I called in to report it and got a recording “we are aware of the problem and working on it now”. Not much to do but wait. I’m glad you got it all straightened out and are back online. I hope it’s a little cooler for you and the crew today. Here in Las Vegas, it is going to be 114* today. Way too hot for me!! Hi Ginger! I’m typing this in a parking lot at the base of the mountain where we are now camped. It’s a gorgeous camp — the best so far — and I wouldn’t be here if Verizon hadn’t given me the run-around! I hope you are getting some cooler weather. What battery to you need? I will buy it here and send it to you. Kath I have had my day with Verizon. Thanks for the offer, Kathryn. I’m all set now. You definitely had a lot of frustrations with Verizon. I am really surprised they are making you pay more each month. That is just icing on the cake, isn’t it? One has to expect this kind of scenario in the world in which we live. I’m glad I don’t have to deal with it very often. What a bummer….if you ever get desperate for internet, most McDonalds have free WiFi. Better than going to the library, cause sometimes they are closed too. oops, never mind, guess without the aircard you were up a creek, and couldn’t use McD’s. But maybe the info will help someone. Hi Kay! Thanks for commenting . . .
Sue, just a suggestion. You might go ahead and order a spare battery for your new mifi so that when this one goes bad you won’t be forced to upgrade again (if they no longer support that model). I got a spare battery for mine and switch them out occasionally just because I think that might make them last longer. They are available a lot cheaper from Amazon or eBay than from Verizon. That’s a good idea re a spare battery. Thanks for the tip. 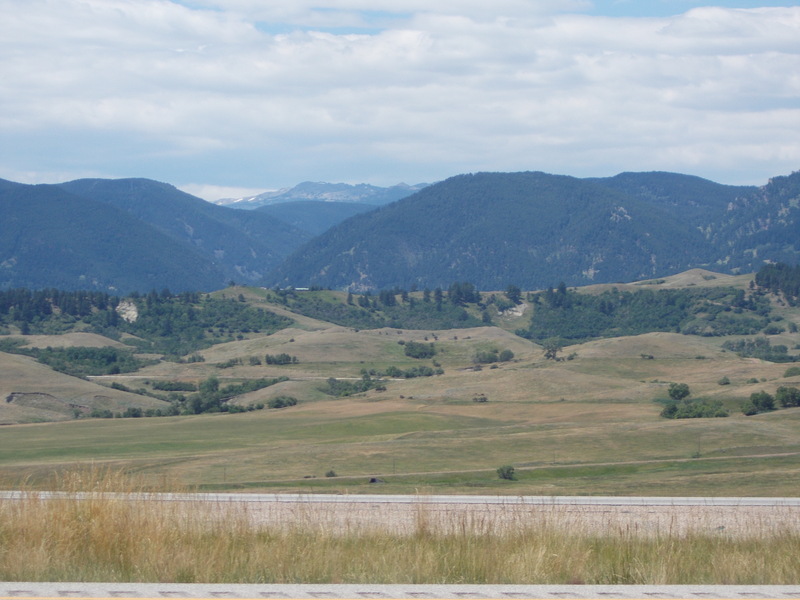 If you head back north from Casper you might enjoy spending some time up in the Big Horn Mountains west of Buffalo, WY. It’s a VERY beautiful area plus there’s a lot of National Forest land to boondock on up in the higher, cooler air. We spent several days at 44.285213,-106.959715 a couple years ago. Fantastic. I was going to camp right where you suggest, but without internet or a decent forest map, I didn’t want to try it…. plus I needed to get to Casper…. Maybe someday! Sorry to hear about all your problems getting a lousy battery. It is unfortunate they can sell you the product, but cannot give you the accessories to run it and expect you to upgrade for more money. Even though I have Verizon cell phone service I really HATE them. They are always trying to get money out of you. I switched my Internet service to Millenicom where for $69.99 per month I get 20GB per month. Prior to that I had Verizon where I would only get 5GB for about $59 per month. What is funny is that Millenicom uses Verizon towers so I am getting the same service. There is a downside to Millenicom. Since they are buying excess capacity from Verizon towers at a very advantages rate they will be the first to loose access when the tower Verizon volume picks up. All is well as long as there is excess capacity! Grd Jct Co called “Battery Plus” for $5.95, my daughter lives in the area and brought it up to me a few days later. Any way I believe they are a national chain, just for future reference. Shy away from Radio Shack if possible. Doubt I will ever shop there again. I don’t like walking into Radio Shacks. What prices! Sometimes when you are having a bad day you just have to surrender yourself to it. I bet it is a day you never forget and certainly one that will make good days even better. One day, but not too soon, if you feel a touch of boredom coming on you can say “At least I’m not chasing batteries” and chuckle to yourself. Well, now that I’ve had time to think back on that day…. If it weren’t for chasing the phantom battery around Wyoming I wouldn’t have ended up in Casper. And if i didn’t go to Casper, I wouldn’t have approached Yellowstone from the southwest which led me to the best campsite I’ve had since fulltiming! Ha! Isn’t that great? Hubby wants to spend 5 months down south next winter in our new-to-us Casita. We did a month last spring coming home from Texas and that was fine; once I got home to our sweet little home and gardens on 14 acres though, I can’t imagine half a year in a Casita! Also, I wondered if you are ever nervous boondocking all alone. Daytime is fine, but when night falls and you’re all alone… You seem brave and confident all the time. Hope tomorrow is a better day, Sue. I can’t answer all the comments right now, but I do want to tell you I LOVE fulltiming and no, I’m never afraid, night or day. Life is too good to mess it up with fear! The crew and I are in the prettiest spot yet! In the desert and the places Sue and Crew have been so far, I can see that she’d have plenty of time and opportunity to blog. Go north to “god’s country” and I think blogging takes a back seat. Sue has just gotten her first taste of some of the most beautiful parts of our country, with even more to come–a good deal of it without wifi. I wouldn’t worry if she doesn’t blog as she once did. Any more than a half hour to an hour in the evening devoted to blogging is probably a waste of time given everything there is to see and experience. Just my opinion. You’re right, hobopals… It’s hard for me right now to stop and write everything down because I’m living in the moment and it’s so good! I am recording everything when I get myself settled into it ,so I can post something as soon as I get a signal again. I have been out of the loop for a bit as the town we were in really didn’t have much AT&T coverage and wifi was terrible, so I feel your pain. Internet connectivity…. emails, blogging, whatever…. is addictive. I have had some withdrawl symptoms! When Mama not happy nobodys happy..
You’re so right, Ron! What’s a day of inconvenience when it’s all good before and after! Nice to hear from you and yes, my crew is brilliant! Mama’s happy now! Don’t be worried, Chuck and Geri …. We’re having the time of our lives and we haven’t even made it to the Tetons or Yellowstone yet! Our campsite view looks like we’re peering into heaven itself! I hope I can post today and show you some photos! No internet at our camp …. If Sue and Crew are in Yellowstone or the Tetons they won’t have any service. I’ve been worried, too. I hope everything is okay and she just doesn’t have service. myrvinglife…. Thank you for your concern. When I don’t post it’s because I don’t have service. Hi, Kathy…. In order to reply to comments or to post, I have to drive five miles down off the mountain where we are camped and use the WiFi of a lodge several miles up the highway. It’s worth it to check in on my blog and kind readers! I just can’t do that every day…. Gas here is $4.65 a gallon! K and I have been south for almost a week with no access to WIFI/phone. Had to catch-up and a few blogs and share Chuck’s concern about not seeing any activity from you of late. Actually, there is Cellphone service at the major tourist venues in both Yellowstone and GT. Old Faithful, Canyon, Grant Village, Fishing Bridge and Lake all have cell Towers. Hello! I’m sorry I haven’t been blogging for a few days. The crew and I are having a great time in a lakeside camp at 9,200 feet! Spike takes a soak every day, the trout are jumpin’, and the air is fresh and cool. It goes down into the 40s at night! I came down off the mountain for groceries and WiFi. I’m sitting in a parking lot typing this. I’m going to try to make a blog post with photos! Thanks for thinking of us . . .
About the pups the behavior. I live on a cul-de-sac in a country setting, with only one neighbor, and sometimes let my little Pepper out to do her business by herself. I know, shame on me : ( One day the door bell rang and the local county patrolman says to me, “Lady, is this your dog?” Where upon Pepper comes around and sits behind me without speaking a word, not one yippy little utterance from her little Pommy self. She could smell my discomfort I guess; I was expecting a fine of big bucks, but got off with a warning and something less than a tongue lashing. Lesson learned. Dogs are so much smarter than we think and a whole lot smarter than their owners sometimes.